Tiberius Claudius Pompeianus (c. 125 – 193) was a politician and military commander during the 2nd century in the Roman Empire. A general under the Emperor Marcus Aurelius, Pompeianus distinguished himself during Rome's wars against the Parthians and the Marcomanni. He was a member of the imperial family due to his marriage to Lucilla, a daughter of Marcus Aurelius, and was a key figure during the Emperor's reign. Pompeianus was offered the imperial throne three times, though he refused to claim the title for himself. A native of Antioch in Syria, Pompeianus was from relatively humble origins. His father was a member of the Equestrian Order. As indicated by his name, his family first received their Roman citizenship during the reign of Emperor Claudius. Pompeianus was a new man ("novus homo") as he was the first member of his family to be appointed as a Senator. Much of Pompeianus' early life has been lost to history. He participated in the Roman–Parthian War of 161–166 under the command of Emperor Lucius Verus, likely as a Legionary Commander. Sometime prior to the Parthian campaign, he was elevated to the rank of Senator. He served with distinction during the war, earning him appointment as Suffect Consul for the remainder of the year 162 AD. Following the completion the Parthian campaign, the Emperor Marcus Aurelius appointed him military governor of Pannonia Inferior on the Empire's northern frontier along the Danube River. [I 1] He likely served from 164 until 168. In late 166 or early 167, a force of 6,000 Lombards invaded Pannonia. Pompeianus defeated the invasion with relative ease, but it marked the beginning of a larger barbarian invasion. Late in 167 the Marcomanni tribe invaded the Empire by crossing in Pannonia. Marcus Aurelius and Lucius Verus planned a punitive expedition to drive the barbarians back across the Danube River, but due to the effects of the Antonine Plague, the expedition was postponed until early 168. Aided by Pompeianus, the two Emperors were able to force the Marcomanni to retreat. Pompeianus' military skills earned him the confidence of Emperor Marcus Aurelius and he quickly became one of the Emperor's closest advisors. As the Emperors returned to their winter quarters in Aquileia, Lucius Verus fell ill and died in January 169. Following the death of Lucius Verus, Marcus Aurelius arranged for his daughter Lucilla, Verus' widow, to marry Pompeianus. As son-in-law to the Emperor, Pompeianus became a member of the Nerva–Antonine dynasty. The Emperor even offered to name Pompeianus as Caesar and his heir, but Pompeianus refused to accept the title. Instead, Pompeianus was promoted and served as the Emperor's chief general during the Marcommanic War. Under his guidance, the exiled Senator and fellow Parthian war veteran Pertinax was recalled and joined Pompeianus on his military staff. Marcus Aurelius died in 180 AD, and his 18-year-old son Commodus, Pompeianus' brother-in-law, was proclaimed Emperor. Pompeianus tried to persuade Commodus to remain on the Danubian frontier to complete the conquest of the Marcommani, but Commodus refused and returned to Rome in the autumn of 180. The relationship between the young emperor and the experienced officer quickly deteriorated. In 182, Lucilla, Pompeianus' wife and Commodus' sister, organized a failed assassination attempt against the Emperor. Though Commodus executed Lucilla and other members of her family, Pompeianus had not participated in the conspiracy and was spared. Following the conspiracy, Pompeianus withdrew from public life, citing old age, and retired to his estates in Italy. He spent most of his time in the country away from Rome, claiming age and an ailment of the eyes as an excuse. Commodus was assassinated in 192 AD by members of the Praetorian Guard. Pompeianus returned to Rome once the plot against Commodus succeeded, resuming his seat in the Senate. Pertinax, who was the Urban Prefect at the time, offered the throne to Pompeianus, but he declined the offer. The Praetorian Guard then proclaimed Pertinax as Emperor, but he was assassinated by the Praetorians after only 87 days for attempting to impose order upon the long-undisciplined unit. Senator Didius Julianus, after becoming Emperor by bribing the Praetorian Guard to proclaim him, experienced difficulty in garnering support within the ranks of his own troops. In a desperate attempt to save himself, Julianus asked Pompeianus to become co-emperor with him. Pompeianus again declined the offer, on the grounds of his advanced years and eye problems. Julianus was executed on the orders of Septimius Severus after ruling for only 66 days. Pompeianus appears to have died sometime in 193. 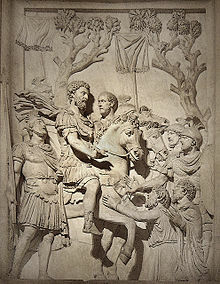 His children survived and prospered as members of an important family: they were the grandchildren of Marcus Aurelius. The prestige was dangerous, because the new dynasty of the Severans could have seen them as possible competition. Aurelius, son of Pompeianus, was consul in 209, but was later assassinated at the instigation of Caracalla. Later descendants of Pompeianus would become consuls in 231 and 241. Russell Crowe's character Maximus Decimus Meridius in the 2000 film Gladiator is loosely based on Pompeianus and others. DIR contributors (2000). "De Imperatoribus Romanis: An Online Encyclopedia of Roman Rulers and Their Families". Retrieved 14 April 2015. ^ Herodian, Roman History 1.6.4-7. ^ Michael Grant, The Antonines: The Roman Empire in Transition, pp. 64-65. ^ Herodian, Roman History 1.8.3-4. ^ Michael Grant, The Antonines: The Roman Empire in Transition, pp. 69-70. ^ a b Cassius Dio, Roman History 74.3.